Today web maps (Google Maps, BingMap, OpenStreetMap, HERE, Yandex.Maps etc.) are not only used for browsing, looking around but also used for finding routes. With these services’s data which cover all around the world, you can calculate routes from one city to another even from one continent to another one. 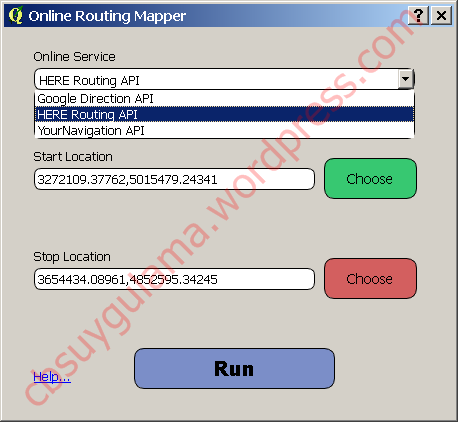 I have developed Open Routing Mapper to be able to use these services in QGIS environment. By using this plugin you can calculate a route in QGIS by pointing start and stop points without having road network data. Also you can get alternative routes by using different services. 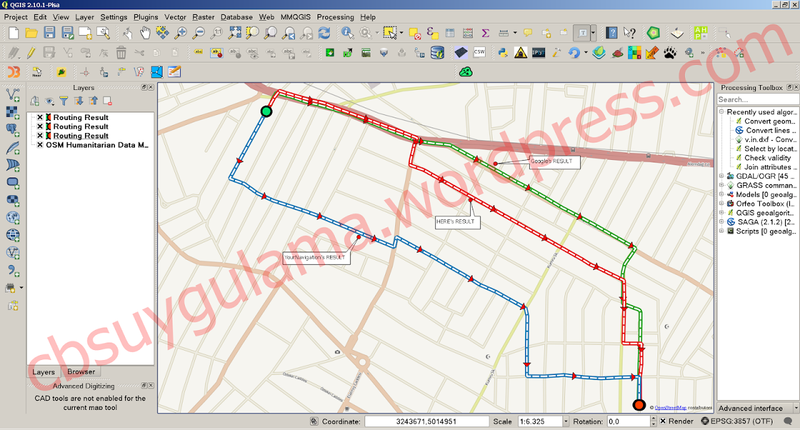 Results could be transformed to different gis formats like ShapeFile, TAB, Spatialite, DXF etc. in QGIS. The plugins initial version (v0.7) supports Google Direction API, HERE API and YourNavigation API for calculation of routes. Firstly start QGIS and add a basemap using OpenLayers plugin. Basemap helps us to determine start and stop point in QGIS canvas. In this sample i added OSM Humanitarian basemap. 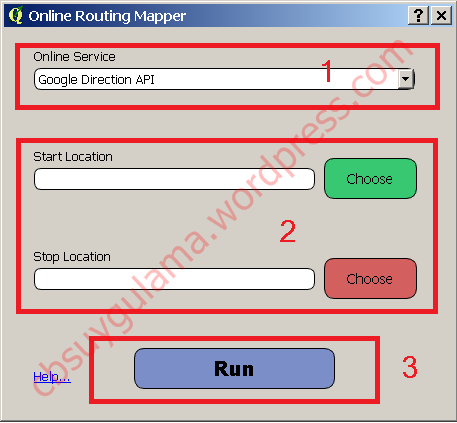 Than open Online Routing Mapped plugin by clicking the icon. The plugin’s window is shown below. It basically consists of three parts: 1- Service selection, 2-Choosing start and stop points and 3- Running the analysis. I calculated the shortest path between İstanbul and Ankara cities as first sample. The plugin’s window for this sample is shown below. In this example Google Direction API was used. You can use different services for these start and stop points, just change the Online Service section and click Run button again. By the way you can also compare the results. The alternative routes calculated by using different services for same start and stop points and the result is shown below. Google Direcion, HERE and YourNavigation API were used this sample. 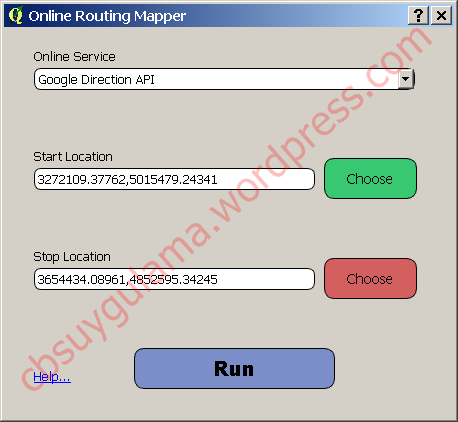 Sometimes Online Routing Mapper plugin could not generate any result according to choosen online service. The error message is shown below. In this case I suggest you to change online service and try again. Also accuracy of the results produced using the Google Direction API could be different by distance between start and stop points. For example the route between two city could be coarse on curved turns. This is a great program.I am interested in using it to map the optimum route between multiple nodes along a path. Is there anyway to pass the points into your plugin via python and for it to output the best/shortest path from the start/finish but touching all the points? It would be nice if the route included some useful attribute such as route distance and travel time. Thanks for your comment. If I get some free time, I ‘ll think about it. Hi, thanks for creating the plugin. The TomTom route planner functionality is broken, however. It display the locations of the spoken instructions. What you want is a polyline from the route itself. Congrats!!!! This is an excellent plugin. I’m wondering if there is a new version wich allows create a route with many stops. Thanks. Greetings from Mexico!!! Many thanks for this plug-in. But can you fix the plug-in for Mac. because I cannot “choose” the point Location. this is different if using Windows Ops. Thanks for feedback. Currently I can only test on Linux And Win environments.